Hollandaise sauce (/hɒlənˈdeɪz/ or /ˈhɒləndeɪz/; French: [ʔɔ.lɑ̃.dɛz]) is an emulsion of egg yolk and liquid butter, usually seasoned with lemon juice, salt, and a little white pepper or cayenne pepper. In appearance, it is light yellow and opaque, smooth and creamy. The flavor is rich and buttery, with a mild tang added by an acidic component such as lemon juice, yet not so strong as to overpower mildly flavored foods. Hollandaise is one of the five sauces in the French haute cuisine mother sauce repertoire. It is so named because it was believed to have mimicked a Dutch sauce for the King of the Netherlands' state visit to France. Hollandaise sauce is well known as a key ingredient of Eggs Benedict, and is often paired with vegetables such as steamed asparagus. There is debate as to who originally developed hollandaise sauce. Some historians believe that it was invented in the Netherlands then taken to France by the Huguenots. In 1651, François Pierre La Varenne describes a sauce similar to hollandaise in his groundbreaking cookbook Le Cuisinier François: "avec du bon beurre frais, un peu de vinaigre, sel et muscade, et un jaune d’œuf pour lier la sauce" ("with good fresh butter, a little vinegar, salt, and nutmeg, and an egg yolk to bind the sauce"). Alan Davidson notes a "sauce à la hollandoise" from François Marin's Les Dons de Comus (1758), but since that sauce included flour, bouillon, herbs, and omitted egg yolks, it may not be related to the modern hollandaise. However, Larousse Gastronomique states that, "in former times fish 'à la hollandaise' was served with melted butter" (implying that at one time egg yolks were not a part of the designation, hollandaise). Davidson also quotes from Harold McGee (1990), who explains that eggs are not needed at all and proper emulsification can simply be created with butter. He also states that if one does wish to use eggs they are not needed in so great a quantity as normally called for in traditional recipes. The sauce using egg yolks and butter appeared in the 19th century. Although various sources say it was first known as "sauce Isigny" (a town in Normandy said to have been renowned for the quality of its butter), Isabella Beeton's Mrs Beeton's Book of Household Management has recipes in the first edition (1861) for "Dutch sauce, for fish" and its variant on the following page, "Green sauce, or Hollandaise verte". Her directions for hollandaise were to "[p]ut all the ingredients, except the lemon-juice, into a stew-pan; set it over the fire, and keep continually stirring. When it is sufficiently thick, take it off, as it should not boil..."
Hollandaise requires some skill and practice to prepare and hold. Properly made, it will be smooth and creamy with no hint of separation. The flavor will be rich and buttery, with a mild tang from the flavorants (e.g. lemon juice). It is best prepared and served warm, but not hot. There are several methods for preparing a hollandaise sauce. All preparation methods require near-constant agitation, usually with a wire whisk. One family of methods involves acidifying the egg yolks to aid in the formation of an emulsion, either with lemon juice or vinegar. Escoffier uses a reduction of vinegar and water. Others use lemon juice or sherry. The acidified yolks are whisked gently over simmering water until they thicken and lighten in color (144 °F/62 °C). Then, as with a mayonnaise, the emulsion is formed by slowly whisking melted butter into it. Use of clarified butter is common. Some varieties of this preparation use water of various volumes and temperatures. Alton Brown espouses quite a different method. The yolks, without acid, are cooked as above. Then the upper pan is removed from heat and cold cubed butter (unclarified) is whisked in, a few cubes at a time. The emulsion forms as the cubes melt. The pan is returned to heat only when the emulsion cools too much to melt more cubes. Lemon is used as a finishing flavor. This method takes more time than traditional methods, but is more reliable in that it is difficult to overheat the forming emulsion. The above methods are known as "bain marie methods". Another family of methods uses a blender. Yolks are placed in a blender, then - at a temperature higher than appropriate for bain marie methods - butter is drizzled into the blender. Heat from the butter cooks the yolks. Blender methods are much quicker, although temperature control is difficult. The products of blender methods may be acceptable, but are generally considered to be inferior to the products of bain marie methods. Joy of Cooking describes a preparation unlike all the above, using whole eggs, and slowly adding the egg mixture to melted butter over direct heat. It also includes variations incorporating sour cream and paprika, or cream and nutmeg. Note that in all methods the temperature must be closely controlled. Too much heat and the yolks will curdle (180 °F/82 °C) or an emulsion break (separate). Too little heat and an emulsion will fail to form, or (once formed), will solidify. Once the yolks are prepared, the sauce should be not much warmer than required to maintain the butter in a liquid state, that is, a little warmer than body temperature. A finished sauce may be "held" in its emulsified state for several hours by keeping it warm. Success with freezing hollandaise has been reported, but it is not widely practiced. A normal ratio of ingredients is 1 egg yolk : 4-6 Tbs. (55g-85g) butter. Flavorings may include lemon juice and salt to taste. 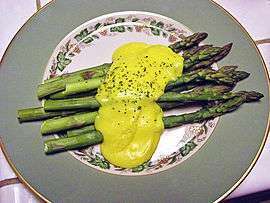 Being a mother sauce, hollandaise sauce is the foundation for many derivatives created by adding or changing ingredients. The following is a non-exhaustive listing of such minor sauces. The most common derivative is Sauce Béarnaise. It can be produced by replacing the acidifying agent (vinegar reduction or lemon juice) in a preparation with a strained reduction of vinegar, shallots, fresh chervil, fresh tarragon and (if to taste) crushed peppercorns. Alternatively, the flavorings may be added to a standard hollandaise. Béarnaise and its children are often used on steak or other "assertive" grilled meats and fish. Madame Benoît's recipe for Mousseline uses whipped egg whites instead of whipped cream. ↑ The family is sometimes referred to as "mayonnaise sauces" as they are, like mayonnaise, based on the emulsion of an oil in egg yolk. ↑ Beeton, Isabella. Mrs Beeton's Book of Household Management, p.405. ↑ Beeton, Isabella. Mrs. Beeton's Book of Household Management, p.406. ↑ That is, in the upper pan of a double boiler or bain marie. The pan should be over, but not in contact with, the simmering water. Room temperature is too low; stovetop burners and even most double boilers are too hot, though skilled sauciers are able to prepare their mixtures over an open burner! ↑ The same method—with no heat, replacing the butter with oil, and adding some ground mustard—is used to make mayonnaise. ↑ In Eggs Benedict, AB demonstrates a variation of the method, working directly over a burner. 1 2 Once solidified, a sauce is almost impossible to recover fully. Try adding heat and a little warm water. A broken sauce may sometimes be recovered by cooling the sauce, adding a tsp. or two of cool water, and whisking vigorously. ↑ Whether for acidification or flavor, the total mount of lemon juice can vary according to taste, but 1 tsp. juice per yolk is a fair limit - more than that (e.g. Cookwise, p.301) tends to produce a sauce with a pronounced lemon note. Host: Alton Brown (16 June 2004). "Hittin' the Sauce". Good Eats. Season 8. Episode 1. 12:15 minutes in. Food Network. Host: Alton Brown (17 June 2010). "Little Big Lunch: Eggs Benedict". Good Eats. Season 14. Episode 4. Food Network. Escoffier, Auguste (1982) [Trans. fm 4th French (Flammarion) ed. 1921]. "Ch. 1: Sauces". Le Guide Culinaire [The Complete Guide to the Art of Modern Cookery] (in French). English translation by H.L. Cracknell and R.J. Kaufmann (First American ed.). New York: Mayflower Books. ISBN 0-8317-5478-8. Wikimedia Commons has media related to Hollandaise sauce.